They say ‘tis better to give than receive. But Sheila Cain and Ina Hodges of Colorado Springs believe both acts can alter lives. As a teenager in Georgia, Russia, young Ina – then Ina Kharaishvili – received an Operation Christmas Child shoe box from America, a country she’d never heard of. Now the mother of a 3 ½ year-old daughter, Hodges still remembers the necklace with a dangling pink pen and the box of crayons she was almost too afraid to use. “At that time, to get anything from America was impossible. It was a miracle,” she said. Always on the giving end of the Samaritan’s Purse ministry, Cain has been filling shoe boxes since 1997. In 2010 she went on a distribution trip to Ecuador. What astonished her most were the kids’ reactions. Instead of rushing to open the boxes full of personal care items, small toys and school supplies, “They would hold it up and look at it,” she said. 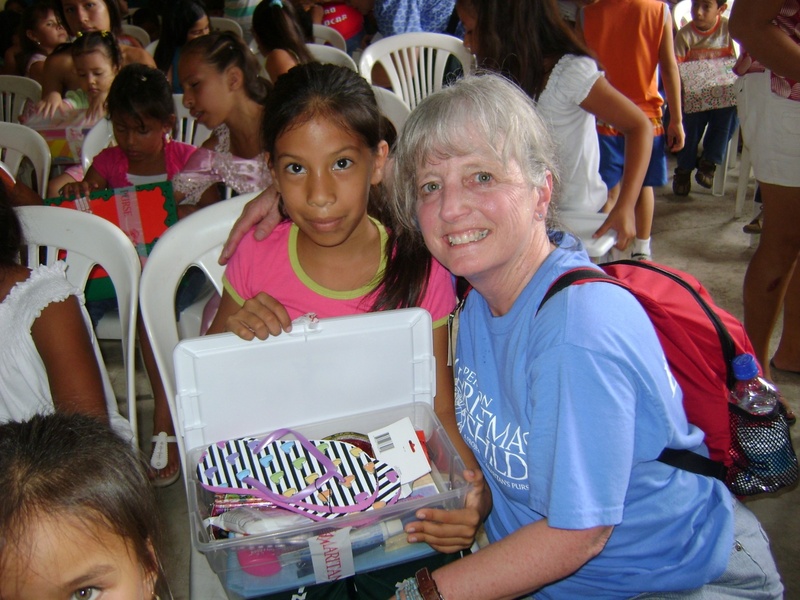 November 12-19 is National Packing Week for Operation Christmas Child. Churches across the country have organizing packing events and scheduled times for bringing in gift items and boxes. But you don’t have to be a church member to participate. Operation Christmas Child is a chance to send a gift to a child who, like Ina, may never in her life have received something meant especially for her. And it’s a chance to show a child how much God loves them. Operation Christmas Child asks that each shoe box be accompanied by a $7 donation. That’s not bad, considering the cost of postage. And if you make your donation online, you’ll get printable label with a barcode connected to your email, for tracking your gift all the way to its final destination. Jennifer Hernandez is the Operation Christmas Child project leader at her church in Colorado Springs. Her kids were so excited about filling shoe boxes this year that they did their Christmas shopping in September. Twelve-year-old Graciela selected pink tie-dye duck tape, a horse figurine and sewing kit for a girl. Nine-year-old Diego picked out a Rubik’s Cube for a boy. For both boys and girls, they purchased reusable water bottles, school supplies and stuffed animals. “Always stuffed animals,” Hernandez said. When people ask her what they should buy, this is what she tells them: something to love; something to take care of themselves (soap, wash cloth, tooth brush, tooth paste); school supplies (ruler, pencils, erasers, sharpeners, colored pencils, crayons, etc; a toy to play with (a little car, doll, stuffed animal or figurine); and something sweet to eat (hard candy but not chocolate). And finally, something to show you care, such as a card, letter or drawing. While in Ecuador, Cain learned that one little boy had wanted an American football, but there was no way his parents could afford it. They didn’t even know how he had found out about American football. Standing there with the children that day, she witnessed a dream come true. Inside the little boy’s shoe box was a Nerf football. Cain later found out that he took the ball to bed with him. On Friday she’s taking little Karina shopping for shoe boxes “I’m blessed to share this life-changing thing in my life. It’s going to be our tradition, always,” she said. Since its 1993 founding, Operation Christmas Child has shipped 95 million shoe box gifts to 130 countries. There are five processing centers in the United States, where each box is inspected and sealed before shipping overseas. This year the organization hope to pass the 100 million mark. Purchased items should be geared for ages 2-4, 5-9, and 10-14. For a list of needed items, plus all the particulars about packing a shoe box for Operation Christmas Child, go online to www.samaritanspurse.org and click on the shoe box with airplane wings. The website can even connect you with the collection center nearest you.